Stores reference 22C/2120. Size 3 Regular. By Helmets Ltd. of Wheathampstead. 1970 dated. 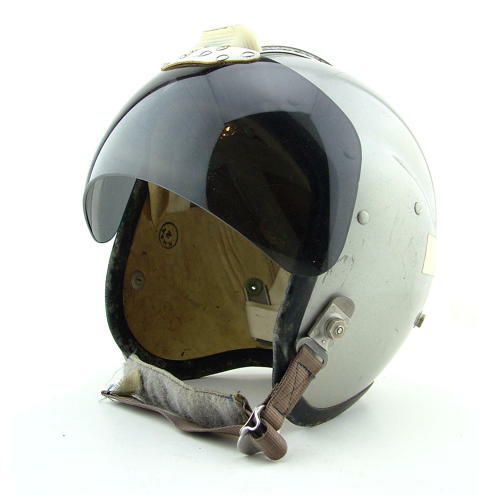 Classic early bonedome worn in conjuction with the type F or G inner helmet that held the avionics and to which an oxygen mask could be fitted. The MK.1A is a basic protective helmet in leather lined fibreglass. It has a simple nylon webbing suspension system fitted inside to give a comfortable fit over the inner cloth helmet (not supplied). An anti-glare visor is fitted, comprising a centre rail attachment and mechanism with a replaceable tinted acrylic anti-glare screen. Original silver paint finish. Good conditon bar the usual stress cracks, scratches and small chips. The rubber edge roll is complete but grubby and has some crazing in places. The lining is reasonably clean. Complete with visor track mechanism in working order. The visor has some light surface wear. Good chinstrap. With velveteen visor cover. Good overall condition. Stock code H22075.